a) “Agreement” shall mean the Material Transfer Agreement signed and executed between the Provider and the Recipient. b) “Material” shall meancultures in solid or liquid or any other form. c) “Provider” shall mean the organization providing the material. In case of this agreement, it will be IACR-NBAIM. d) “Data” shall mean any data that may have been supplied along with the material and or any data that is generated from the transfer of material. 2)Provider: ICAR-National Bureau of Agriculturally Important Microorganisms (IACR-NBAIM), Mau Nath Bhanjan-275103, UP,India. Scope of Agreement: This Agreement applies to the use, handling, sale, distribution and any other use of the Material by the Recipient. The Microbiological materials provided by ICAR-NBAIM are not intended for use on humans. The microbiological materials designated as biosafety level 2 or 3 constitute known pathogensand the Recipient agrees that other Microbiological Materials not so designated may be pathogenic under certain conditions. Recipient assumes all risk and responsibility in connection with the receipt, handling, storage, disposal, transfer and use of the microbiological materials, taking all appropriate safety and handling precautions to minimize health or environmental risk. Recipient agrees that any activity undertaken with the Microbiological Materials will be conducted in compliance with all applicable guidelines, laws and regulations and that Investigator will obtain all permits, licenses or other approvals required by any governmental authority in connection with Recipient receipt, handling, storage, disposal, transfer and use of the Microbiological Materials. Recipient shall not distribute, sell, lend or otherwise transfer material to a person or entity (notparty to this MTA) for any reason, without prior written permission of ICAR-NBAIM. Any commercial use of the microbial genetic material is strictly prohibited without prior written consent of DARE/ICAR/ICAR-NBAIM. Recipient acknowledges and agrees that use of certain genetic material may require a license from a person or entity not party to this MTA (Third Party Term). Use of microbial genetic material may be subject to the intellectual property rights of a person or entity not party to this MTA. This agreement shall be governed by and construed in accordance with the laws of India including of Biological Diversity Act of 2002 and 2004, without regard to the conflicts of the law principles thereof.Recipient is solely responsible for compliance with all the foreign and domestic, federal, state and local statutes, ordinances and regulations applicable to use of the microbial genetic material. Without limiting the generality of the foregoing, any shipment of microbial genetic materials from India to other countries must comply with all applicable foreign and Indian Laws, including the Indian export control laws and related regulations. Under no circumstance, DARE/ICAR/IACR-NBAIM will be liable for any indirect, special, incidental or consequential damages of any kind in connection with or arising out of MTA. IPR issues related to the exchange of microbial genetic material will be governed by ICAR IPR regulations. a)Commits a breach of any term of this Agreement and if the breach is capable of remedyand the breaching party fails to remedy the breach within 14 days after being required to do so in writing by the non-breaching party i.e. the Recipient. b)Upon termination of the agreement, the Recipient shall have no rights to use the material or data provided by the Provider for research and shall return all data ad shall return all data provided by Provider in original copy within 15 days of termination of agreement. a)The data arising out of the research undertaken by the Recipient will be considered joint property of the Recipient and the Provider if cultures given to him/her are for research purpose. b)Recipient is encouraged to publish, present or otherwise disclose the results of research arising from the Recipient’s use of biological material. This disclosure should include origin of the material and data and any applicable patent or copyright notices accompanying the material or data. 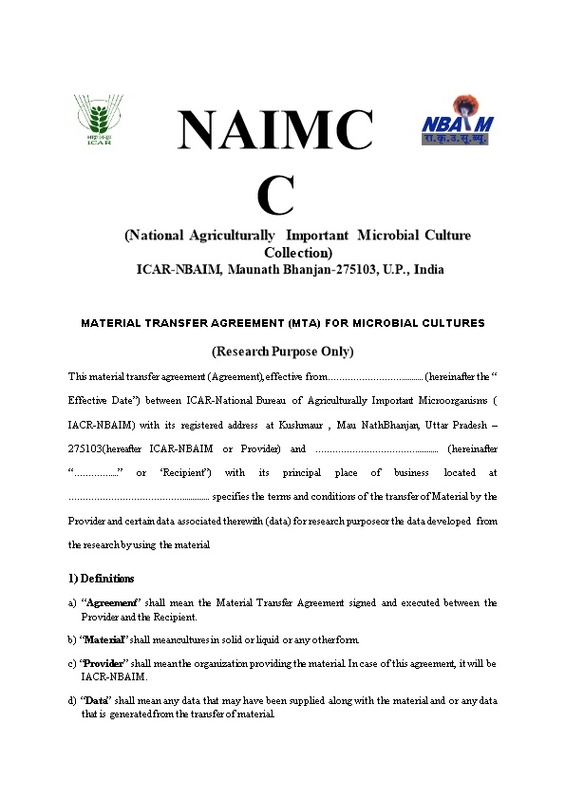 Recipient must reflect accession number of microorganisms assigned by NAIMCC in the publication arising out of use of microbial cultures. c)The Recipient agrees to acknowledge the Providerorganization ICAR- NBAIM, Government of India in all publications arising out of research on the biological material. We, the duly authorized representatives of...... (Nameof Recipient)and...... (Name of Provider) acknowledge and agree to the terms and conditions contained in this Material Transfer Agreement, as evidenced by our Signatures below.